MMMMM….mac and cheese…one of my favorite comfort foods. Usually I make it as a side, but this week I decided I wanted a main dish mac and cheese, so this is what I came up with. 1. Cook the macaroni according to package directions. While the macaroni is cooking, take out the cream cheese and butter to allow it to soften. 2. Cook the bacon and allow to cool. 3. Drain the pasta and transfer to a large bowl. Add the butter and cream cheese and stir until melted. 4. Add the tomatoes, spinach, bacon, ham, garlic powder, salt, pepper, Italian cheese, and shredded cheddar and stir. 5. Spray a 13X9 baking pan. 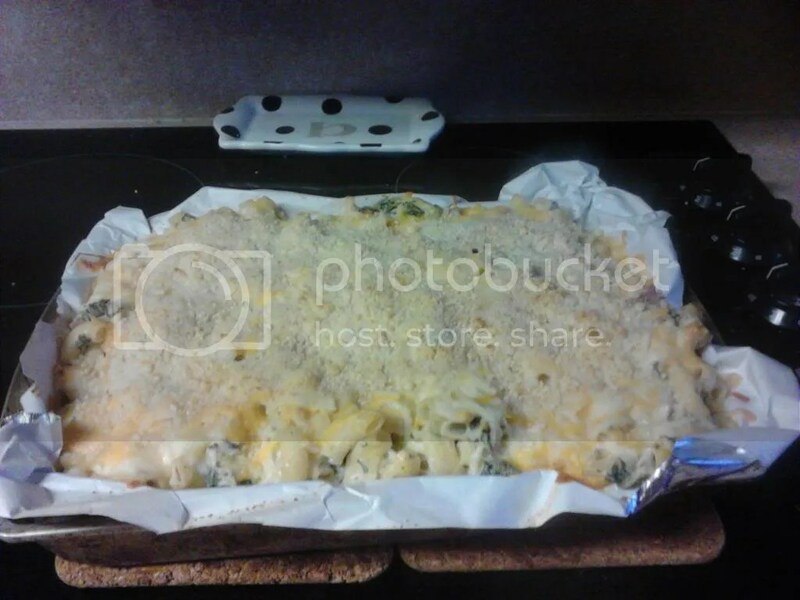 Transfer the macaroni to the pan, cover, and bake for 30 minutes at 350 degrees. 6. Uncover and sprinkle with the bread crumbs and Parmesan cheese and bake for 5 more minutes or until the cheese is browned. I’ll admit it, I am one of those people who loves every season! In the fall I love the cooler weather and the pumpkins, in the winter I love sitting outside by the fire and celebrating the holidays, and spring brings welcome relief from the cold. Right now, summer is my FAVORITE season. There is just something about the lazy days with nothing important to do. Here are some of my favorite things about summer! Family time in the pool! Florida is really hot right about now…90 degrees or higher every day. 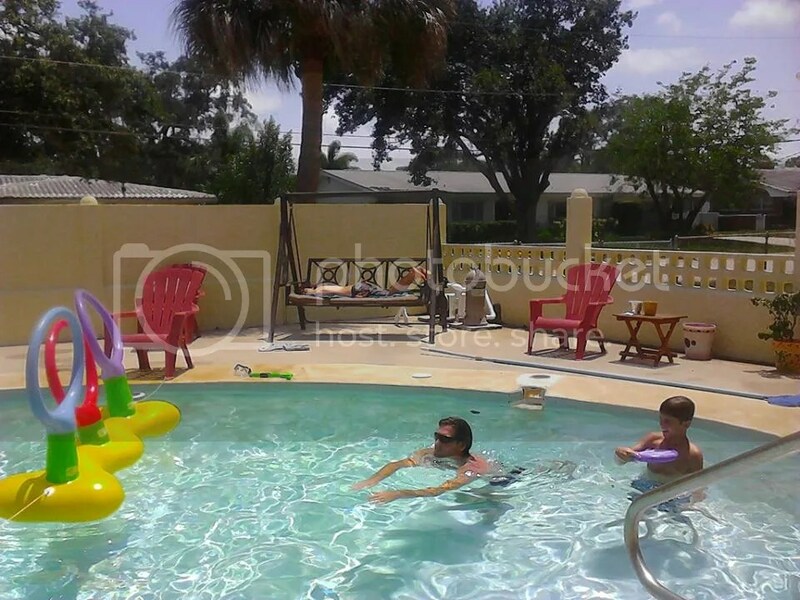 We are fortunate to have a house with a pool, and we take advantage of it! On my husband’s days off, he hangs out with us too. We play games and swim and just enjoy some hang out time together. Beach days!! 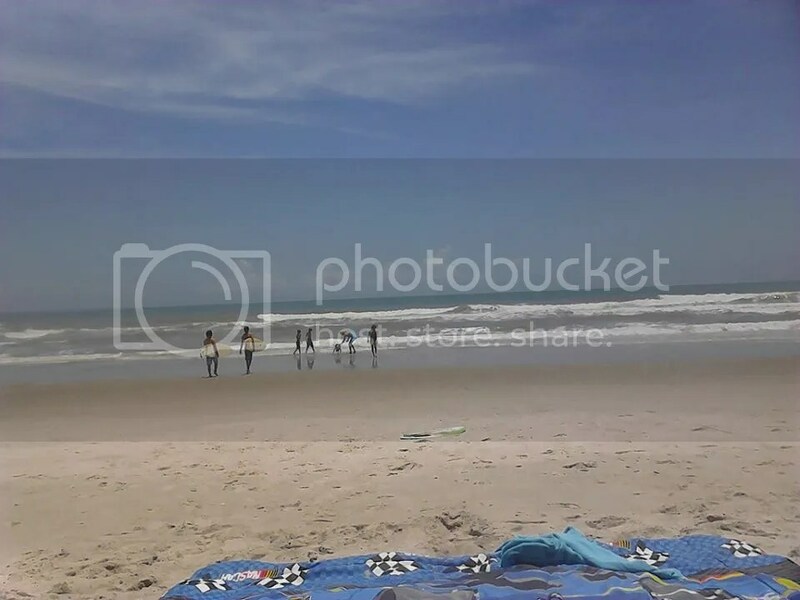 We live about 10 minutes from the beach and we spend a lot of time hanging out with friends there. (After all, the beach is free 🙂 ). For the 4th of July this year we spent the day surfing, boogie boarding, and playing in the waves. We also love to bring our portable grill and cook up some hot dogs while we are there. Being residents, we know the importance of a beach tent to keep you cool and out of the sun, so we and some of our friends set them up and make a day of it. In the summer, the carnival comes to town! Heading out to the fair brings back memories of my childhood. 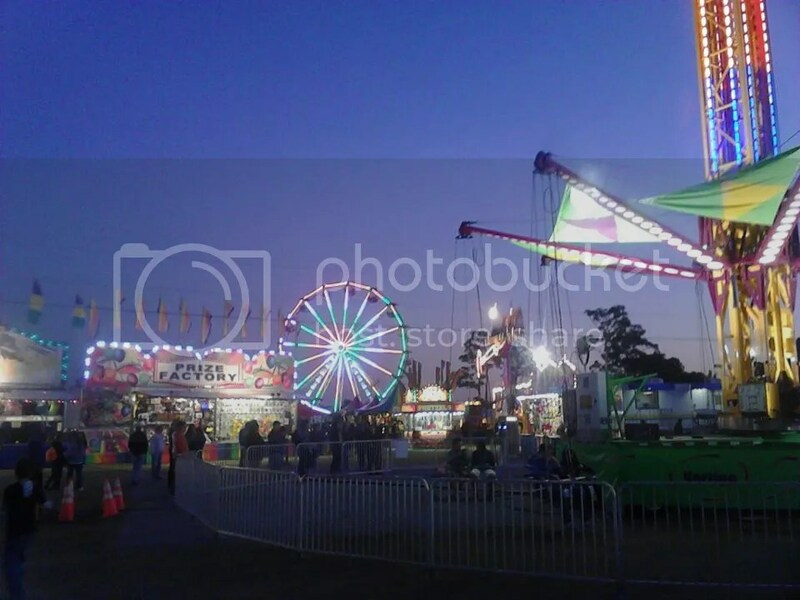 The carnivals around here run for a couple of weeks, and they usually have a night when the families of local police officers and firefighters get in for a discounted price. We make sure to take advantage of that or any other offers we find. The last carnival had a great clown show the kids enjoyed, and of course, there are the rides and the food. It’s a pretty fun family night for us. 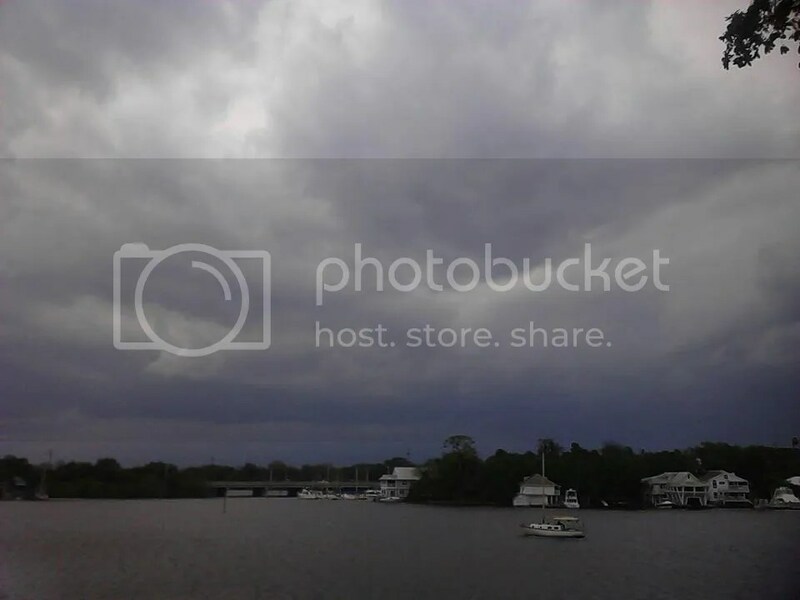 Afternoon thunderstorms are my next favorite thing about summer. We get them pretty much every day for the season. To me, there is nothing better than curling up in my comfy chair with a good book and listening to the rain come down. If my kids are bored we will watch a movie or play a game while it thunders outside. Those are some of my favorite things about summer. What are yours? Let me know in the comments! I love spinach. And artichokes. This is a tasty little side dish I cooked up the other day. 1. Heat oil in skillet over medium heat. 2. 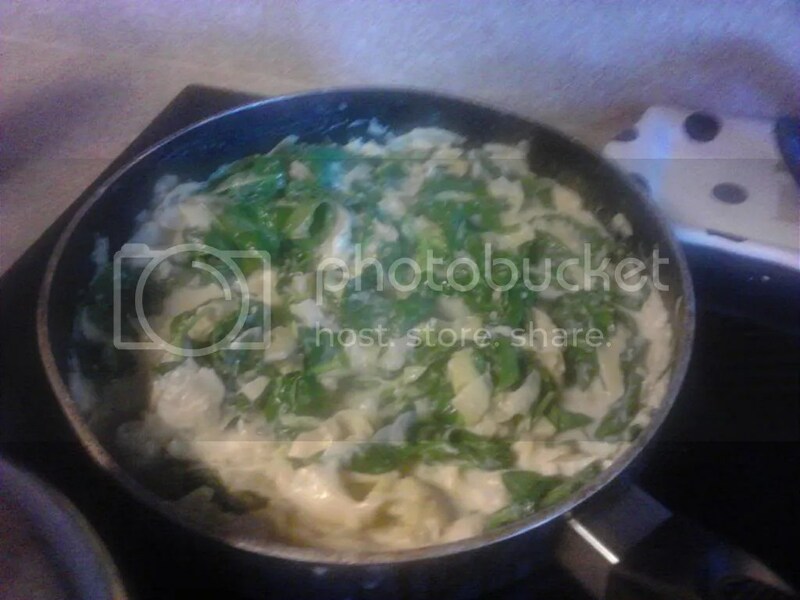 Add the spinach and stir, cooking until it starts to melt. 3. Drain and add the artichoke hearts. 4. Stir in the white wine and sour cream, cook until heated. Ah sweet friends! I write today from a very full heart. If you have been reading my blog you know that my husband has been struggling with health issues for these past few months. He was sent to the hospital from work back in May because he was having chest pain. The original diagnosis we were given was something called pulmonary hypertension. This is a scary and almost always deadly disease. After much research on the internet and discussion with doctors, all we felt was more fear. I am a believer, and I know that God is in control of all things. But it is so hard when you are looking at your children and thinking about what you will do if their father is no longer there. After a lot of talk, we decided to seek a second opinion from an expert. My husband was experiencing daily chest pain and shortness of breath. A firefighter and athlete, he was becoming more and more frustrated by his inability to do the things he was used to doing. So, he made an appointment at the Mayo Clinic in Jacksonville. At this point, I had decided to put this matter fully into the hands of the Lord. As hard as it was, every time worry would start to creep up in my head I would pray about it and give it to God. I trusted He would take care of it. During this time, especially during our vacation, I felt this overwhelming sense of peace. Like somehow, even in the face of all this opposition, everything was just going to be okay. So, after his visit with the doctor, we were told he was misdiagnosed!! He does NOT have pulmonary hypertension. Instead, the doctor told him that his level of athleticism and his workouts had built up the muscle wall on the left side of his heart to the point that his heart had to work harder to pump blood. Imagine that…I guess there is such a thing as too much exercise. Talk about a miracle. After being told by numerous doctors that pulmonary hypertension was THE problem, and almost resigning ourselves to that fact, God moves and turns the situation completely upside down. Now, there are still some matters to address. The doctor thinks my hubby’s chest pain may be asthma related. During the course of his job he has been exposed to all kinds of smoke and chemicals, which could have caused some damage to his lungs. He recommended that we follow up with a lung doctor here and perhaps try some medication for that. He also recommended a sleep study because he thinks that sleep apnea may be responsible for my hubby’s exhaustion. So, what a difference a week makes. I am convinced that this is just another example of how God moves in our lives. These last few months have been difficult, but they have spurred a lot of discussion between my husband and I about what is truly important and what things we absolutely want to focus on in this life. There are things we have been wanting to do but have kept putting off because, well, life is busy and money is short. But here’s the thing, we are never guaranteed tomorrow and if you keep putting things off you may never get a chance to do them. So, we are now refocusing our priorities yet again, and actively working on accomplishing some of those goals we have been putting off. I want to thank all of you who have been praying through this with me. Your support means more than you know. Our life is not easy by any means. We still don’t have enough money to go around….and with these doctors visits we are only going to owe more money (wrestling with our insurance company is a whole other topic I could blog about), but really, in light of what could have been, that’s okay. I know that we will get by. God will make sure that we have enough to put food on the table and keep a roof over our heads, and as long as we are all together, then that is really all we need. Have you ever heard those stories about people who use coupons at the store and saved hundreds of dollars and wondered how they did it? 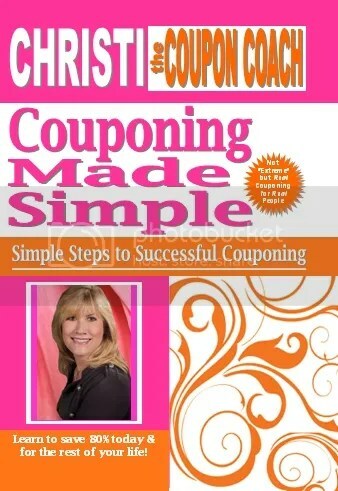 Christi the Coupon Coach explains how in her book Couponing Made Simple. I have to admit, I am one of those people who does clip coupons, but does not have the time or energy to go to extremes to do so. Fortunately, Christi’s book has lots of suggestions that you can implement as you choose. The book itself has short chapters and is very easy to read. I took it with me and read it by the pool during my vacation. Christi includes lots of details about how she finds deals, and pictures of what she buys and how she sets things up. I found these very helpful because I am a visual person. She begins by talking about success stories and then goes into the basics of coupons. Did you know that those little coupons you collect out of the machines at the store are called blinkies? I didn’t! The part of the book I found most helpful was the section on organization. If you have read my blog before you know that this is not an area of strength for me. I cut coupons from the paper and shove them in an envelope. I take this envelope to the store and then sort through it as I shop hoping to find something I can use. With Christi’s approach, you actually plan your shopping around the coupons, instead of hoping for a random connection. In the book she details an extensive filing system for her coupon booklets, and also how to find internet coupons and link them to sales. Okay, so I did not apply the filing system exactly. What I did do is get myself a small file where I could organize my coupons by category, making them easy to sort through in the store. Actually, my oldest son (who frequently shops with me) had suggested I do something like this a while ago, and even said he would help, so I took him up on it. I had him read the sections of Couponing Made Simple where the author describes how she organizes and he took the reins and set up my coupon file for me. The file holder I got is small enough to fit in my purse, which makes it convenient to carry to the store. I also appreciated the section of the book where Christi talks about using the internet to find sales and match coupons to them. Did you know that there are a lot of websites that link coupons to the sales flyers put out by local grocery stores? Christi has links to blogs where the authors sort through the flyers for well-known stores and provide links to printable coupons so you can print them and get the most for your money. 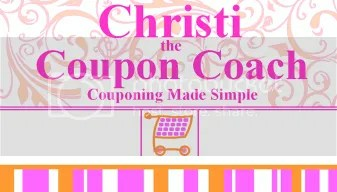 You can find Christi’s link here: http://christithecouponcoach.com/Christis_favorites.html. Now, I have not gone as far as to adopt every suggestion in the book. Like I said, time is my big challenge here, and this method of couponing does take time. However, just using a few of Christi’s suggestions saved me $60 on my last trip to Publix! When I came home and showed my hubby he told me I needed to do the rest of the stuff in the book! I plan to continue to work the rest of Christi’s suggestions into my routine over time. Saving money is a big concern for everyone these days, and groceries are a major part of the budget. Couponing Made Simple is available on Amazon for $18.00, and I think it is definitely worth it. This book can teach you techniques that can potentially save you hundreds of dollars. If you are interested in trying to trim some money off your weekly trip to the store, check this book out. Learning real life lessons is a very important part of growing up. I remember the little bits of advice my grandparents would give me when I was a girl, and many of them have rung true as I have gotten older. I try to make it a point to share the same principles with my kids here and there, and I have discovered a resource that makes this easier. For this review, we got to check out a book by Ed Douglas Publications. It is filled with easy to talk about life lessons that you can fit into your homeschool day. This book is intended for children in grades 6-12. 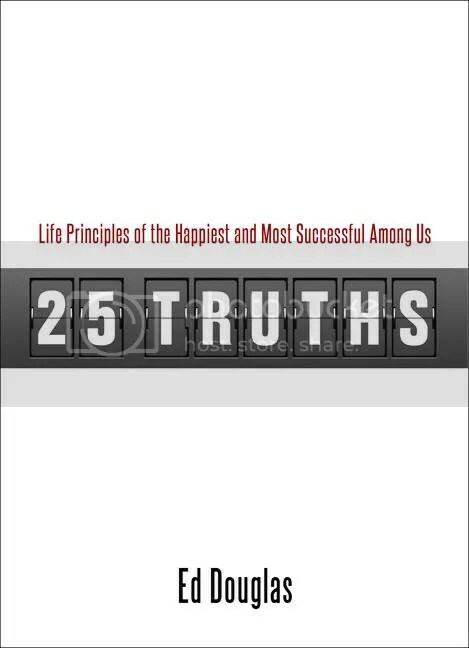 The book is called 25 Truths and it is written by Ed Douglas himself. Douglas is a former bank president, an avid tennis player and coach, and a Christian family man. The book is based on a list of tips Douglas would share with his high school tennis players in an effort to teach them about life as well as coaching the team. Over time, the tips evolved and he put them into this book. Each chapter in the book is focused on one truth. They are focused on a wide range of topics including “tell the truth”, “never surrender”, “play to win”, and “you’ve gotta believe”. Each chapter begins with the truth itself, and few quotes related to it. Some of the quotes come from Bible verses and some do not. The chapters themselves are short, about 1-3 pages, and can be easily read aloud in a few minutes. At the end of the chapter are a short summary of the point and questions designed to encourage discussion about the topic. I found the questions to be very thoughtful, encouraging you to think about how each truth applies to your life. For example, in the chapter about being quick to apologize, Douglas asks you to think about a time when you did not apologize and you should have, and what the consequences of that were. He also asks you to think about a time you did not receive an apology and how that made you feel. I read this book out loud to my rising 7th and 10th grade sons over lunch. We would cover one truth a day about 3 days a week. After reading it to them, we would talk about the general meaning of the truth first, and then I would give them some time to think about it. Later in the afternoon we would revisit the topic and go over the other questions. I found that my sons had some very thorough and thoughtful answers for most of the truths. 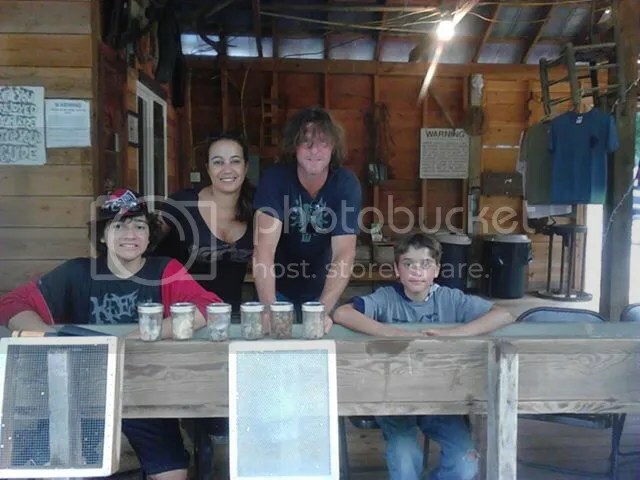 When discussing taking things one step at a time, my oldest talked about how when he was trying to save over $300 for a camp he wanted to attend with our church youth group, the amount seemed overwhelming (he was 14 at the time). However, he decided to break that number into a monthly goal instead, and decided how many cars he needed to wash each month to get there. The result was he easily saved enough to pay for camp and some extra for spending money. My 12 year old son applied the “make every day your best day” truth to his favorite show, Phineas and Ferb 🙂 To him, they model trying to simply have the most fun they can each day, and they do not let setbacks get in the way! I found myself thinking a lot about the truths Douglas writes about as well. The truth about seeing the glass as half full, and having a positive outlook on life spoke to me in particular in my life right now. My discussions with my kids also gave me a lot of food for thought. This book is designed for kids grades 6 and up, but I think it could be used with those that are possibly even younger as long as you are reading it with them. An older child could also read it on their own, but I feel there is a lot to be gained by reading this as a family and talking about it together. It’s a great way to share your stories with your children, and for them to share their thoughts and feelings with each other and with you. 25 Truths costs $15.50 and I think it is definitely worth it. If you did three truths a week, you could finish in a couple of months. Of course, you could easily move faster or slower if you want to, and you could expand these truths into more thorough lessons if you wanted to add some picture books where the main character learns a similar lesson or search for biblical references. Douglas is a Christian, he does talk about God and faith in 25 Truths, but I did not feel the book was preachy, just honest. These truths are applicable to everyone, and this book could be used in any homeschool. MMMM…the grill. We love cooking outdoors, especially when we are hosting friends. This is a really easy recipe for grilled veggies that we make frequently. 1. Wash and slice the squash and zucchini. 2. Layer some foil to wrap the vegetables. 3. 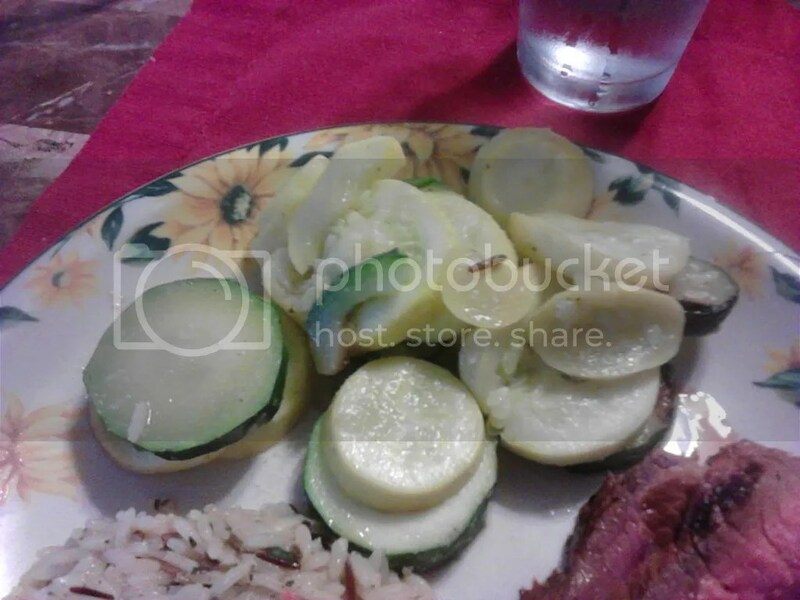 Place the squash and zucchini in the foil. 4. Place the butter on top of the veggies and sprinkle with the salt, pepper, and garlic powder. 5. Close the top of the foil to seal the vegetables. 6. Place on grill and cook for 20 minutes over medium-high heat.